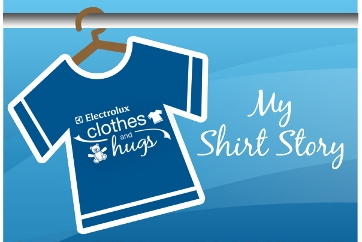 This blog entry won 4th place in the My T-Shirt Story Contest sponsored by Electrolux. I didn't win the Grand Prize, but it is nice to hear that there are people who think that my shirt story deserves to win. More importantly, I find fulfillment in knowing that there are people who got inspired by my story and find new meaning in the word, Think. 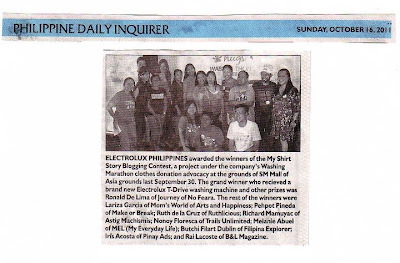 You see we were even featured in Philippine Daily Inquirer! 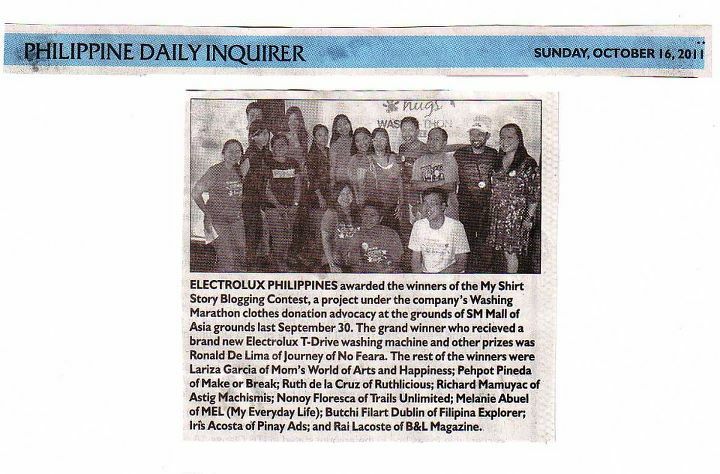 Thank you to Electrolux and to bloggie friends for the support! When people say I write good pieces. I am not convinced (because most of them are my friends! ), even if I have won from several contests (my first winning was when I was in Grade School), I don't feel that I am that good. It gives me goosebumps when people at work call me a "writer" - I feel that the word is too heavy for me to digest and put in my system. I don't even follow a certain writing style, I just write whatever it is on my mind that the Editor in Chief of our company newsletter loves to assign me articles last minute, thinking I just breathe the words and they string sentences, paragraphs and articles. The blog contest asked us to talk about a shirt story. I didn't find it hard to think of the shirt that I want to feature - no, it is not the shirt I wore when I met the loverboy (because I was wearing a lace sleeveless top then - yes, I still remember! ), and it is not the shirt I took off just when Freestyle's Let's Take It Slow song was playing on the radio (Hehe). It is a shirt I received as part of the prize for winning the Essay Writing Contest in celebration of our company's centennial celebration. But I am no artist and I am sure my niece would even get a higher grade in Drawing Class if you would compare my masterpiece. How about a photo-collage?! It looks like a mess, and I'd rather not post it..
Then I thought of making a video. But looking at my casting, I know I would be the next Petra Mahalimuyak with the grand production number. 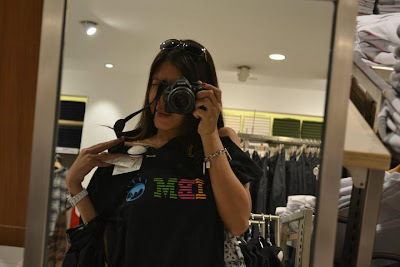 So I thought I would just present it and do it the same way how I earned the t-shirt I am donating - that is, to write it with passion and movitation. So my story started when once upon a time, the ASEAN Team of our company called for entries for an essay. The theme is - describe the company's milestones and 100 years of existence and its impacts on our lives. The mechanics stated that we can only submit an essay with 200 words. That was the biggest challenge for me - putting everything what's on my mind, compressing a company's history and contributions like a zip file, and showing how proud I am to be part of the company. I submitted my entry and continued with my life, thinking I had already shared my views and winning would be like an extra bonus. I was surprised when the winners were announced and my name was on the list together with other names from different countries in the South East Asia! You see, even my favorite guy in the world was so proud! I have to erase one part/word.. For censorship ;) Forgive him, he's just excited! The prizes arrived and though the package is not as grand as the newest gadget in the market, I was so happy because I got limited edition memorabilia. This one shirt is so simple - black with just five-letter word imprinted on it but it gives the greatest impact, it made me THINK. I just thought this is the best shirt that I should share because it not just represent the celebration of my company's centennial year but also my winning and my realization that (yes), I can somehow write good pieces worthy of awards and congratulatory words. I wanted to share the shirt - it is simple black with five-letter word imprinted on it that is both commanding and inspiring. I wanted to donate this for the benefit of typhoon victims. It is not just the ordinary statement shirt that screams the beauty of being single, or how cool it is to be macho. It is brand new, with tag, never used and in excellent condition. I want to give something decent, and not just any ratty shirt I usually wear at home or when I sleep and dream of my prince charming. More than giving warmth and clothing for those who ever would receive this shirt, it would also serve as an inspiration to those who would love to look at the people's chest and shirts designs. THINK is the least the politicians, celebrities, bloggers and even simple netizen and citizen like you and me can do to change the world. Think before you click. A popular campaign of one giant network which aims to promote responsible use of social media. Think for bloggers who must first think and think once more before hitting that publish button. Think for entrepreneurs on how they can innovate and promote their products and businesses. Think for a guy who is torn between two lovers. Think for the girl before saying Yes to Mr. Right. Think for politicians. Enough said. Think for countless people who are part of the unemployed statistics. Think before you throw that garbage. Think before you let go of that sling when playing Angry Birds. Think is just one word that defines the company that I am working for, and that simple word which gave way in shaping our world in its 100 years of existence (Trivia, did you know that IBM introduced bar codes? travel reservation system, magnetic strips and so many other technology that changed our lives). Think is also guiding us as we are shaping our next century. It helps us collaborate, innovate and be more responsible; and even shaped our values which we apply in our daily lives. Maybe some of you may have been part of our celebration as we gave back to the community and environment when we celebrated our centennial (and I am sure some may even had received the same shirt). I just hope that with this simple post and simple shirt, I am helping inspire and build a smarter planet. So there goes my T-Shirt Story. What do you THINK? What is your tshirt story? Note: If I get permission to publish my essay, would add it in this blog post.